David Tubb’s Superior Shooting Systems currently offers two high-BC bullets, both produced by Sierra Bullets to David’s specifications. The original DTAC is a 115-grainer with a normal match hollowpoint. The second bullet is a 117gr MJPT (Metal Jacket Plastic Tip), with a super-high 0.600 BC, confirmed by actual field tests. Independent testing confirms many of David’s statements. A series of dual-chronograph tests done by Larry Bartholome and Ken Oehler showed that there IS significant bullet-to-bullet BC variance in most boxes of bullets. After testing over 30 brands of projectiles, Larry and Ken found the average extreme spread in BC was 0.019. On the other hand, plastic-tipped Hornady A-Max bullets showed the smallest BC variance of the samples tested. So maybe Tubb really is on to something here. Bullet pointing tests also suggest the importance of reducing bullet-to-bullet BC variance. Jason Baney’s recent work with the Whidden Pointing Die showed that the reduction of bullet meplat diameter (by pointing) produces a significant increase in effective BC–as demonstrated by less bullet drop at long range. CLICK HERE to Read Jason’s Bullet Pointing Analysis. 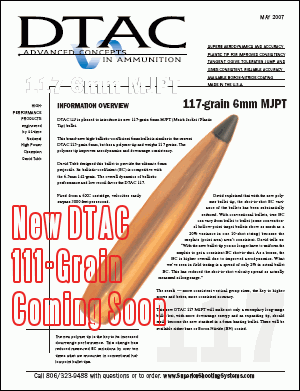 Share the post "Tubb Releases New 111-grain DTAC with Polymer Tip"